Other Ingredients Natural Vegetable Capsules, Microcrystalline Cellulose, Stearic Acid, Magnesium Stearate, Silicon Dioxide, Calcium Silicate, Highly Refined and Concentrated Omega-3 Fish Oil (anchovy), Capsule Shell (gelatin, glycerin, purified water), Natural Lemon/Lime Flavor, and a Proprietary Antioxidant Blend (consisting of natural tocopherols, rosemary extract, and ascorbyl palmitate). Serving Directions 1 packet per day or as recommended by your health care professional. 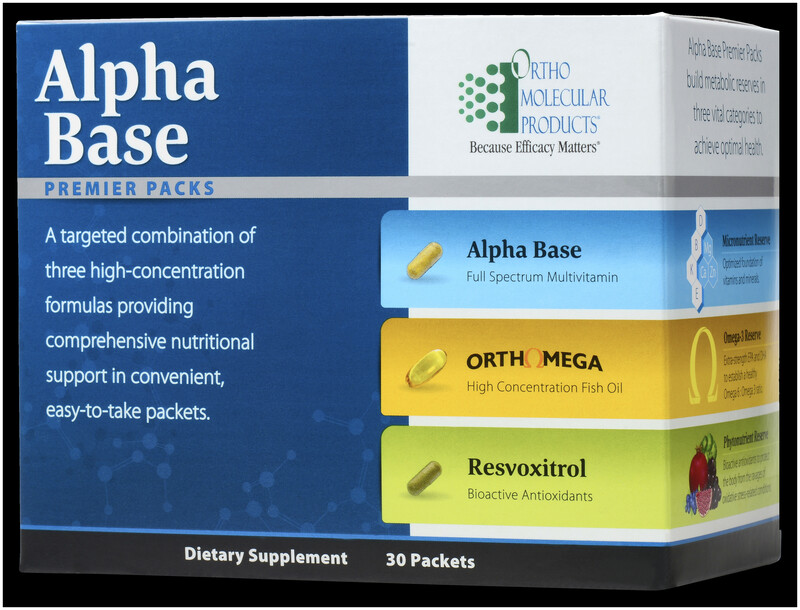 Brand Intellectual Property (IP) Statement Information ORTH½MEGA® Betatene® is a registered trademark of Cognis B.V. ‡ChromeMate® brand niacin-bound chromium. ChromeMate® is a registered trademark of InterHealth N.I. Quatrefolic® is a registered trademark of Gnosis S.p.A. Patents Pending K2VITAL® is a registered trademark of Kappa Bioscience AS. DimaCal and TRAACS are registered trademarks of Albion Laboratories, Inc. Bororganic is a trademark of Albion Laboratories, Inc. truebroc™ is a trademark of Brassica Protection Products LLC. pTeroPure is a trademark of ChromaDex Inc.
Precautions WARNING: All forms of Vitamin K may interact with blood thinning medications. If you are taking such medicines please consult with your physician before taking this product. Do not consume this product if you are pregnant or nursing. Consult your physician for further information. As with all dietary supplements, some individuals may not tolerate or may be allergic to the ingredients used. Please read the ingredient panel carefully prior to ingestion. Cease taking this product and consult your physician if you have negative reactions upon ingestion. Storage and Handling Information STORE AT ROOM TEMPERATURE. KEEP OUT OF REACH OF CHILDREN. This product was sealed for your protection. Do not use if outer seal is missing or damaged or inner packets are torn, punctured or unsealed.